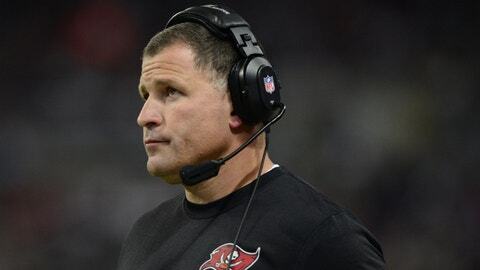 Greg Schiano's 11-21 record in two seasons in Tampa Bay did not help any future plans he may have had for the Buccaneers. Flush it. Sweep it away. Forget it all. It happened. Coach Greg Schiano and general manager Mark Dominik are gone. Be honest: You were looking for an excuse to stick a stake in the 2013 Tampa Bay Buccaneers, a 4-12 nightmare that was part circus on the field, part crazy off it. Clean slate. Clean start. Clean conscience. "The results over the past two years have not lived up to our standards," Bucs co-chairman Bryan Glazer’s 78-word statement began, "and we believe the time has come to find a new direction." That’s what this regime change is about. A new vision. A needed new path. There wasn’t enough return on investment for high-dollar signings such as safety Dashon Goldson and cornerback Darrelle Revis. There wasn’t enough progress, even after Schiano and Dominik made the right move to bench Freeman in favor of rookie Mike Glennon before Week 4. There wasn’t enough optimism for the future, even if Schiano’s toes-on-the-line vision was given all of 32 games to survive. The Glazers saw enough throughout the past two years. Most others did too. The picture wasn’t pretty: A 11-21 record, losing streaks of five games last year and eight this fall, a team that never sniffed the top of the NFC South in late December, a messy break-up with a former franchise face. Buccaneers first head coach Greg Schiano and general manager Mark Dominik. The Schiano era, barring a major pivot, was never going heal itself from the bruises of 2013. There could have been tweaks to the offensive staff. There could have been changes to a unit that averaged 18 points per game and slogged through Sunday after Sunday. But how much good would replacing coordinator Mike Sullivan have done? Buy Schiano and Dominik one more year? Delay the inevitable? The cuts of 2013 were too deep to proceed with the status quo. This was a doomed year from the start, when Freeman waged a mutiny against the franchise that once placed its faith in him. "I think we did get it right," Schiano said of his team’s quarterback situation. "I just think we got it right late." Certainly, there was a case to be made for keeping Schiano and Dominik. Freeman turned into the Invisible Man in Minnesota after a gruesome start against the New York Giants in Week 7. Glennon showed flashes of handling the job (2,608 yards passing and 19 touchdowns to nine interceptions). The MRSA incident that involved three players was a distraction no one saw coming. The Bucs won four of five games from Weeks 10 through 14. But the right decision was made. Schiano and Dominik are good men. The past year, though, was ugly for their franchise. The Bucs, at times, were embarrassing. Fans became despondent. "FIRE SCHIANO" billboards were bought. Boos at Raymond James Stadium were heard by those who bothered to stick around after the latest loss. Apathy is the greatest enemy for any NFL franchise. The Bucs’ bar has been lowered to a concerning level: Four losing seasons in five years, only two years with more than four wins since 2009, no playoff berths since 2007. This roster is better than that. A defense that includes Revis and Goldson, Gerald McCoy and Lavonte David should be good enough to give the Bucs a chance in the NFC South, not get lit up for 42 points and 468 yards against the New Orleans Saints. The Bucs’ offense, even with injuries to Doug Martin and Mike Williams, should produce more than 277 yards per game. This team underachieved. This team failed. 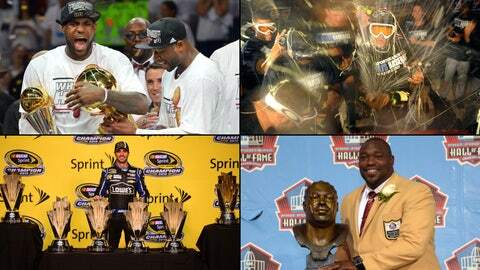 Take a look at the sports stories that shaped Florida in the past year. The choice facing the Glazers is an important one. It’s time for the coaching carousel to end. The Bucs swung and missed on Raheem Morris after three years. They whiffed on Schiano after two. 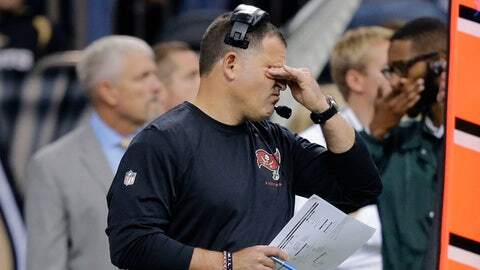 The next Bucs coach must include parts of Morris (his relaxed leadership style) and Schiano (his attention to detail). Mostly, though, he must have staying power. A sound offensive mind should be required too. A turnaround is possible. Look at the Kansas City Chiefs under Andy Reid. Look at the Philadelphia Eagles under Chip Kelly. Look at franchises that understood their shortcomings before making smart, calculated choices about where they wanted to go. This league is built for struggling franchises to contend in time. But under Dominik and Morris, then Dominik and Schiano, the Bucs couldn’t break through. That’s concerning. Since 2008, the Bucs are the only team in the NFC South not to win a division title. Worse yet, the Saints, Carolina Panthers and Atlanta Falcons have each won two in that window. "I think we’re leaving behind a football team better than when we got here," Schiano said. The conclusion most saw coming. Flush it away. It’s a new day.